Whew, was one of those weeks that only happens every couple of years. You may have noticed that we launched OUR NEW WEBSITE last week!!! I have a very large site with tons of written and audio content (especially in the behind-the-scenes where my course content is stored) --- so it's a bit of a bear to revamp and move it all (we moved web hosts too). So a big thank you to Jessica, Theresa, Chris and Pat --- my wonderful team for working on this giant task these last months and putting the bow on it this week ... well done gang! 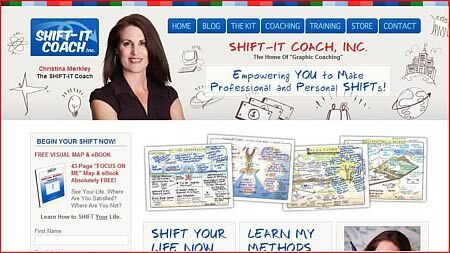 Click to View New www.shift-it-coach.com Site. I'm also continuing to research and write the 'Orphan Rescue' process that I showcased last week. Had a quick talk with Sheila Gillette, my friend and colleague (Sheila is the direct trance medium for the Ask Theo teachings - which I've studied and received guidance from for years). Looks likely that we'll be moving forward with some collaborative offerings ... perhaps a tele-series (to begin with) and in-person workshops (later on) that combine her THEO Teachings with my process facilitation and coaching. A great combo to help people actually DO their "Soul Integration" work (resolve your inner blocks so you can smoothly manifest your soul-directed path). 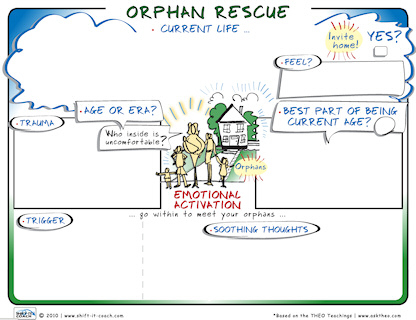 Last issue I shared a visual map and part one of Orphan Rescue instructions. This week is part two. Try it yourself or drop-in for assistance during SHIFT-IT Central® on Mondays nights. I'll keep you posted when The Gillettes and I have our exciting new collaborations together! "No matter how skilled we might be in leading others, nobody can do effective inner work in isolation. We all need skilled and genuine help at times. At SHIFT-IT Central on Monday evenings, we are 'all in it together' ... it's a safe, authentic place to bring our challenges out of darkness and into light ... remove the barnacles in a very accepting setting. Christina creates safety not only through what she does but through who she genuinely is. Whether through my own coaching or listening in on others, I harvest valuable nuggets that translate into real results in my work and life. I am surrounded by ideal clients who are a pleasure and joy to work with. What was once a 'virtual reality' (imaginary vision) is now concrete reality!" Living the Law of Attraction Starts Next Week! Learn "Interactive-Graphics" to enhance your consulting, facilitation, training or coaching work with groups or individuals. 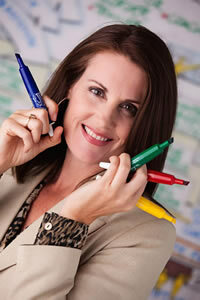 Hands-on, direct mentoring with recognized female teacher in this lucrative niche. This professional skills training equips you with the base skills to do Custom Chart Work, Graphic Recording, Graphic Facilitation and Graphic Coaching --- the four main applications of working visually to reduce conflict, misunderstandings and confusion and to enhance strategic thinking, decision-making and performance. FYI: all artistic levels welcome, you DO NOT need to be an artist to effectively employ this client-pleasing method..
Full Details and Online Registration ***Early Bird on Now, Only 5 Spots Left! After the initial round of soothing, see how what you are saying is 'landing' with your orphan. Are they taking it in? Are they understanding what you are saying to them? Find out if there is anything else that they are concerned or confused about and explain that layer of things to them too. Often these traumatic situations have several layers to them. For example, a child who is being yelled at by an upset adult may not understand what the adult is saying or why they are saying it in the manner they are. They may be upset, scared or intimidated by the energy coming at them. They may incorrectly internalize messages that because this adult is upset at them, they are 'bad' or 'not enough', or 'not wanted'. Or some other equally damaging message that the child internalizes and carries with them through their life (all the way into your adult life now!). Set your orphan straight. Just because someone is mad at them does not mean they are inherently bad or worthless. Teach them the healthier way of looking at things. If you don't know what to say to your Orphan, think of what you would say to any child of their age caught in a similar situation. If you are a parent, what would you say to your own child? If you aren't a parent, think of your friend's or colleague's children or even children in general. Another tactic: bring in your Future Self or Higher Self to speak to your orphan. Also, seek the assistance of a qualified therapist or coach to help you 're-wire' and 're-program' the erroneous thinking (and feeling) that your orphan took on. (Note: I say 'feeling' because these feelings can have long ranging effects ... in Law of Attraction speak, a person's 'vibration' or 'frequency' can be set from these childhood experience seemingly mysteriously attracting like situations until the original trauma is SHIFTed). Say to your orphan "would you like to come and live with me?" and "you don't need to stay here anymore, you can come and live with me". Explain what your adult life is like (where you live, what your home is like, what you do, who is around you). Wait for an answer. Most orphans will jump at the chance to leave the scene they have been playing out over and over in order to come and join you in a new life. If you encounter any resistance, ask what they are concerned about and find a genuine way to soothe whatever concerns or hesitancies exist. When your Orphan has given their permission to join you --- take them by the hand (or in the case of a very young child, pick them up and embrace them) and bring them forward in time. Be sure to 'collapse time' behind you. Feel the old scenario collapsing in on itself, never to be resurrected again. The only way to go is forward --- forward into the tine and place of your own adult reality. When your Orphan has had an opportunity to quickly take in your surroundings, spend a moment defining your roles. You, as the adult, are now responsible for this younger you. It is now your responsibility to parent her or him (in the case of a young child) or mentor her or him (in the case of older children and young adults). Make a pledge or promise to them to be the parent and/or mentor that they never had. The parenting that they received in the past was most likely lacking. Now you have the opportunity to be the kind of parent or mentor that they truly need. You can right the wrongs of the past and enable this Orphan to finally fully flourish --- most likely using talents, abilities and gifts that were hampered before. Now you want to fully welcome them to be their full selves (as their natural energies and talents can often hugely benefit your present life). If you are dealing with a younger Orphan, it is important to explain to them that you are the adult and they are the child ---- and it is not their responsibility to get involved in the adult issues of your life ... that is your territory and responsibility, not theirs. Their role is to be a kid and enjoy life! You will take care of the adult responsibilities like your career or business, earning and managing money, interacting with other adults, any adult problems that come up, etc. This is very important, as sometimes our Orphans have been running the show! It's important to have them be in their appropriate spaces in your life and you the adult to be in the leadership role in your own life! Your Orphan can often help you by providing creativity, enthusiasm, talents and gifts --- but ultimately it is your responsibility to look after them ... not them look after you! Go back to the original incident in your life that provoked the whole Orphan Rescue process. Consider it. Now, after doing this process, how do you feel about it? Is it as charged as it was? Do you have a different perspective or connection to it? If so, another indication that you have done successful inner work! If not, you may have another layer of Orphan Rescue work to do ... as sometimes there are several orphans connected to a triggering situation in our life. Rescuing one of them will make a difference, however you want to do a thorough job of rescuing all of them to get full relief and integration. Orphan Rescue Assistance: Intrigued by Orphan Rescue? Having a tough time doing it on your own? While self-coaching yourself via my maps and instructions is helpful, it sometimes helps to have me personally coach you through your Orphan Rescue work. I have a drop-in coaching community every Monday evening at 5pm pacific called SHIFT-IT Central®, where we often do Orphan Rescue work. Swing on by for some direct assistance. 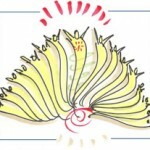 Call for Volunteers: The material I have shared with you today is the preliminary start of a new self-coaching product. Over the course of the next weeks and months I will refine the map and instructions and add audio examples (of me coaching clients through their Orphan Rescue work) and hopefully a guest audio with Sheila Gillette and THEO on their Soul Integration and energy shift perspective. If you are interested in being a volunteer, requiring an audio recording of your Orphan Rescue session, please contact my assistant Chris Miller at [email protected] to express your interest to be added to my volunteer list.